TOYOPEARL AF-rProtein A HC-650F is a high capacity Protein A resin for monoclonal antibody purification. 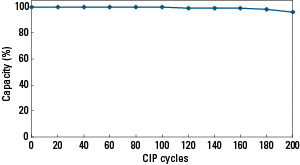 An enhanced rProtein A ligand is bound to the TOYOPEARL HW-65F base bead via multipoint attachment resulting in excellent base stability for up to 200 CIP cycles with 0.1 mol/L NaOH. 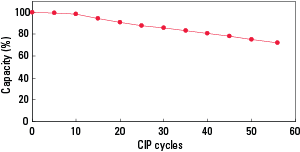 TOYOPEARL AF-rProtein A HC-650F resin maintains 80% of initial dynamic binding capacity after 40 CIP cycles with 0.5 mol/L NaOH. TOYOPEARL AF-rProtein A HC-650F resin exhibits dynamic binding capacities of greater than 65 g/L at residence times of 5 minutes and greater than 50 g/L at 2 minutes residence time with feed stock concentrations from 1.0 g/L to 10.0 g/L. 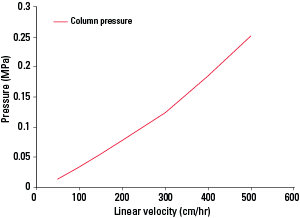 Achievement of high linear velocities at relatively low pressure enables high throughput at production scale using equipment with moderate pressure limitations. 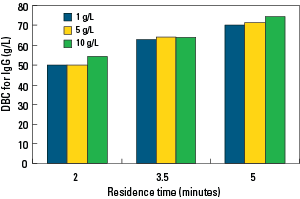 Improved mass transfer characteristics allow it to maintain a larger percent of its capacity at lower residence times relative to agarose base stable resins. 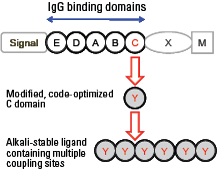 Typical leakage for this rProtein A ligand is 0.6 -1.7 ng rProtein A /mg eluted antibody by ELISA testing. Though TOYOPEARL AF-rProtein A-650F resin is shipped in 20% ethanol, it can be stored in 2% benzyl alcohol if necessary. TOYOPEARL AF-rProtein A HC-650F utilizes an alkaline resistant recombinant Protein A variant. This non-animal derived ligand is bound to the base bead, Toyopearl HW-65F, using multipoint attachment. This contributes to both the resin's alkaline resistance and its low ligand leakages in the range of 5-25ng/mg IgG. 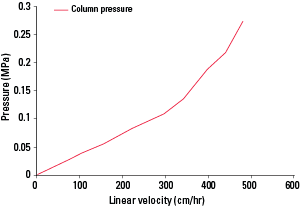 Good pressure-flow characteristics and kinetics contribute to maintaining good capacity, particularly at low residence times. 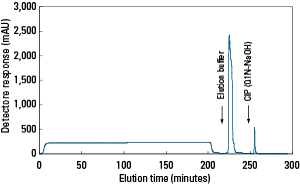 TOYOPEARL AF-rProtein A HC-650F is available in one particle size, 45 µm, which corresponds to the F-grade designation for TOYOPEARL resins.